How many classical scores call for a Jew's (or mouth) harp? Charles Ives' Holidays Symphony features a brief solo for the instrument in the 'Washington's Birthday' movement, and, apparently, Beethoven's teacher Johann Georg Albrechtsberger composed seven concerti for the Jew's harp. Which exhausts my list of classical works using it, although readers will doubtless add more. Of course there are more examples in rock, including John Lennon's contribution on mouth harp to The Fool on the Hill. My question is prompted by listening to French flautist Pierre Hamon's album Hypnos which features a guimbarde (French Jew's harp) on four of the tracks, and some other pretty exotic sounds on others including the duduki played by the Armenian master of that exotic wind instrument M. Malkhassian. Pierre Hamon is a formidable flautist in his own right , but he is probably best known to readers for his appearances on many Jordi Savall discs including Diaspora Sefardi. And staying with the Jewish thread, Hypnos includes a bewitching improvisation on the Sephardic song Las estrellas de los cielos which is also on Diaspora Sefardi. 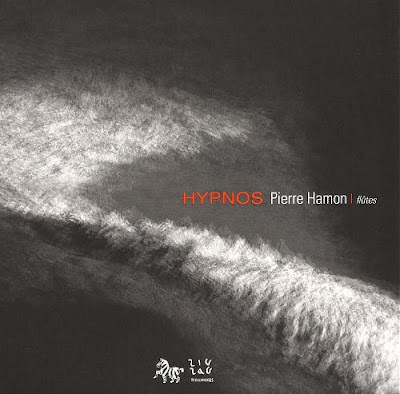 Hypnos, which mixes Pierre Hamon's own compositions with arrangements of traditional music and works from established composers ranging from Guillaume de Machaut to Mario Lavista, is on the independent and innovative French Zig-Zag Territoires label. I bought it when it was first released in 2006, but rediscovered it through my adventures with chance radio. There are some interesting points here. How many CDs are there ripe for rediscovery already in your collection? Randomly selecting albums for reappraisal can be very rewarding, not to mention money saving. But beyond that, we are all obsessed either with new releases or the great recordings of the past. Which ignores some wonderful music that has slipped unoticed into the catalogue in the last few years, like Hypnos. If you are interested in the early music meets world music meets improvisation meets jazz space to the left of Jordi Savall, and I know many readers are, Hypnos is well worth exploring. Another album of flute music ripe for rediscovery here. George Crumb calls for mouth harp in "Songs, Drones, and Refrains of Death", his cycle for baritone on Lorca texts. I think he also uses the instrument in one of the more recent "American Songbook" pieces, though I don't recall which at the moment. James, thanks. I just knew readers would expand my list. When we have more works using the mouth harp, and I am sure there are more, I will add them to the Wikipedia page which does not mention the George Crumb work, but mentions the Ives. Lukas Foss' American Landscapes for Guitar and Orchestra. Thanks Robert. From this I have to assume that the mouth harp is more popular with classical composers in the States than in Europe. But interestingly Hypnos is a French album. I don't even know what a Jew's harp sounds like and I very much doubt I'll find this album here. But thanks for opening another window. A mouth harp is a mouth-blow harmonica, not a jew's/jaw harp. Thanks Daniel, but I'm confused. Wikipedia says The Jew's harp, jaw harp, mouth harp, or Ozark harp, trump and juice harp thought to be one of the oldest musical instruments in the world. It would not be the first time Wikipedia was wrong. But further research indicates that a mouth harp can be either a Jew's harp or a harmonica. So it a Jew's harp or a harmonica in those classical compositions? Clarification from other expert readers is welcome. In my experience, blues musicians call a harmonica a "harp", but not a mouth harp. The latter term seems to be a euphemism for what is more commonly called a Jew's harp. Crumb calls for a Jew's harp, though I don't recall at the moment if the score uses the term mouth harp or Jew's harp.